Arne Westerman, a watercolor artist from Portland, Oregon, recently taught a workshop near Dayton and I was one of the fortunate students who worked with him. Arne (pronounced "Arnie") is a delightful combination of talent, wit and intellect; his workshop is one of the most productive I've had in terms of expectations meeting results. His book, Paint Watercolors Filled With Light & Energy is a must-read for people-painters. Q. Arne, you told us you are essentially a self-taught artist. How did that work for you? A. I think it worked fine. I always drew and cartooned as a kid and it seemed natural to turn to art after my stint running an advertising agency. I was hungry to learn. I enrolled in a series of workshops by artists whose work I admired. That pointed me in the right direction. I had visions of paintings I wanted to do and I spent the next 20 years trying to sharpen my skills. I'm still somewhat envious of artists who have received bachelor or master degrees in art; mine was in journalism. But over the years I find that college doesn't necessarily produce good working artists. Q. 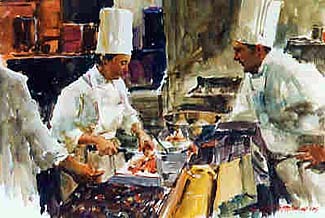 Did your work in advertising play a part in building your foundation in watercolor painting? A. Yes. I had experienced a tremendous amount of fine art through my agency. That was an intense schooling experience. In my agency I usually sat in sessions with my art director and worked with various graphic designers and illustrators. There I could often make suggestions on ways to improve the effectiveness of an illustration or design. I think I learned to appreciate what worked and what didn't in terms of style, color, balance, design. Q. Have you always had this focus on the figure, portraits and people in the environment? Why have you chosen to specialize in this? A. I love being around people, watching, listening, imagining feelings projected by their conversation, body attitudes, etc. 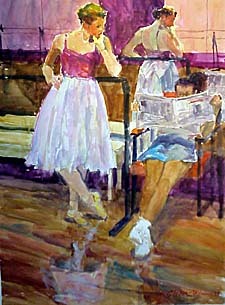 I started painting landscapes, but found paintings I most enjoy focus on a figure or have figures in them. It's rare to me that a landscape can't be improved by adding one or more small figures. When I started in 1978 I thought figures were harder to do than landscapes. After all, everybody knows what people look like. I wanted to make a living in art. So I also opted to paint what I liked in hopes there would also be less competition in figure painting. Q. Who are your favorite artists, past and contemporary? Top five? A. That's a tough one. It's awfully hard to stop with five. 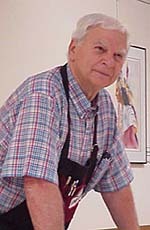 David Levine is tops in watercolor, then Milt Kobayashi and Burt Silverman. Vuillard I absolutely adore. I can end happily with Toulouse Lautrec. Q.How do you gather source material for your paintings? A. Actually from two sources: those I see and those I stage. I often travel with a small camera. As I walk, I watch people and quickly snap scenes which "talk to me." If possible I tell the people I'm an artist, that they look beautiful and I hope to do a painting of them. Most often they will ask for a photo of the painting. If one turns out, I'll send a print. My other source is my feelings. I have ideas I want to stage, just like a movie director. For those I arrange for models and settings. These are played out in homes and public places like restaurants, shops, and hotels. I work fairly fast photographing scenes as I arrange them. I then work from the photos, painting in my studio. Q. In the workshop you taught us a three-step design process. Can you summarize that for us here? A. It's something I learned in advertising. Our artists were always asked to submit thumbnails to give us an idea of their thinking. These very small studies could be done quickly and would reveal the artist's approach. Once one was approved, the next stage was to ask for a comp to show the idea, colors, etc. in more detail. This would be presented to and understood by the client and his staff. The last stage was the production of the finished work. I began painting like everyone else by starting with a full sheet. After an enormous number of failures, I incorporated my three-stage process. The first abstract stage in pencil tells me immediately if I will end up with a successful painting. The second, done in color, tells me if the colors I choose will be exciting and effective. That means I have solved most of the problems before the painting takes place. It also allows me to execute the work more freely and make it look more spontaneous. Q. What advice would you give budding people-painters? A. The best advice is to enjoy watching people. Take the time to listen to their stories and appreciate their lives. Open your heart to their feelings or try to imagine their feelings. Watch how they express themselves with their gestures. Paint those. The work of a good artist reveals the emotion under the expression of the subject. That's not technique: it's empathy. Take photos, sketch wherever you can. Be open. Watch. Visit museums, look at paintings in publications, get ideas. Thanks, Arne Westerman, for some terrific ideas. eMail Arne about his workshops and visit his web site.